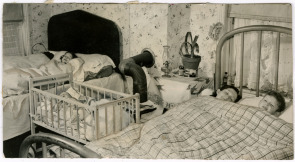 Caption reads: ALL FIVE sleep in the same room on the second floor. In winter, even with little stove going full blast, they shiver under the covers, They burn about half ton of coal a month. In summer ice is picked up when dumped from refrigerator cars on Delaware ave. Top room (used for storing) is tiny, frigid in winter, insufferable in summer. Children go to bed at 8 P.M., Mrs. Iveson at 11. She's up again at 7 A.M. and the youngsters an hour later. Nights punctuated by horns shrieking from the river, puffing engines crashing freight cars against on another from the tracks.